Beautiful certificate from the Rochester City and Brighton Railroad Company issued in 1867. This historic document was printed by Sandmeyer Lithographer and has an ornate border around it with a vignette of an a horse driven railroad car. This item has the signatures of the Company's President, Patrick Barry and Secretary, W. H. Holmes and is over 139 years old. 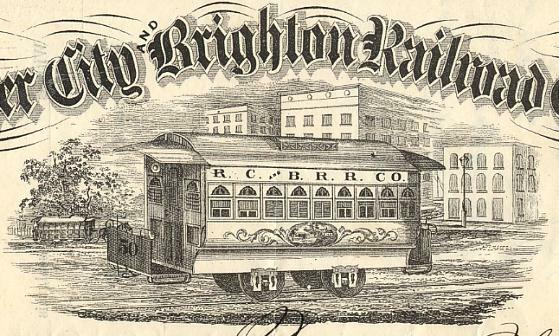 The Rochester City & Brighton Railroad Company operated horse-drawn trolleys on track that extended 9 miles. The Rochester City & Brighton Railroad was succeeded by Rochester Railway Company. This latter company proceeded to electrify Rochester�s streetcar system, beginning in 1890 with the important South and Lake line. An overhead trolley wire was built and new cars ordered during the summer of 1890. On October 28, a trial run over the Lake line was successfully conducted, and regular service with electric cars began the next day. On November 29, with overhead construction on the South line completed, horsecars were withdrawn over the entire Lake-South line in favor of the new electric cars.